…and three for Sales Data. …and here’s the basic structure of the Relationships Graph. As you can see, webvisits are related to states via the “st” abbreviation, and sales are related to employees via a standard foreign-to-primary-key relationship. Charts will be produced from the “virtual” table, and note that the table occurrence is named “v”, and that “v” is not related to any other table. The “break” field will be used for sorting purposes, and, in one case, to provide a report-style subsummary header. And if you’re wondering about v::serial, as its name implies it’s a standard serial number, i.e., 1 for the first record, 2 for the second record, 3 for the third record, etc. And here are the layouts, with chart layouts highlighted. We’re going to use Mikhail Edoshin’s Fast Summary technique to slurp up summarized values from Web Visits and Sales Data, and push those values into $$variables, or, more accurately, $$variables[withReps], which will be parsed by the virtual table with v::serial corresponding to the $$variable[repNumber]. Each variable repetition number will correspond to a chart, and (with the exception of Example #6, which we’ll see in part 2) each chart will correspond to a record in the virtual table. If you’re already familiar with the virtual list technique the preceding paragraph probably makes at least some degree of sense; if you aren’t and/or it doesn’t, don’t worry, things should become clear as we explore the examples. …and the delimited data will be assembled in these $$variables[withReps]. All of the chart types in the demo are either “Column” or “Line”, and the chart setup will look like this, or some variation thereof. Remember this is a reusable object, so the optional titles ($$xTitle and $$yTitle) are defined whether we populate them or not. If we leave them empty, no harm done, they simply won’t display. 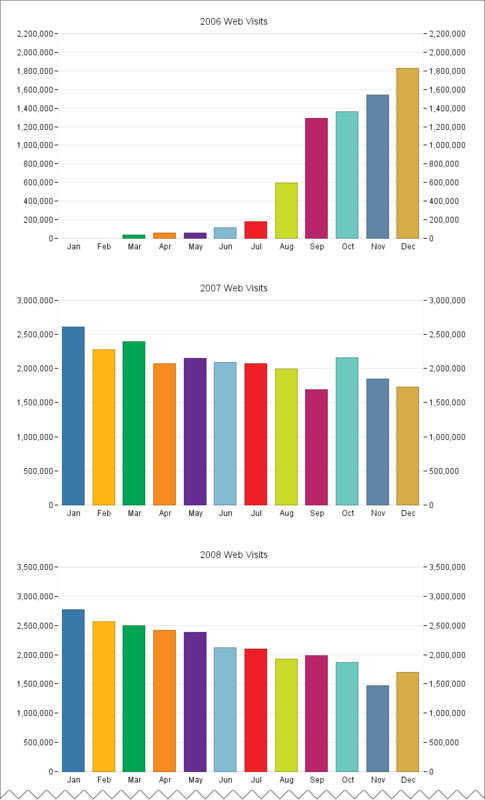 In this example, we want to generate a separate chart for each year, with 12 columns representing the monthly web visits for January through December. We don’t care what state the visits are coming from, we just need to produce one chart per year, with 12 columns per chart. Assuming we run this demo in the year 2014, we will end up with nine charts, for the years 2006-2014 inclusive. 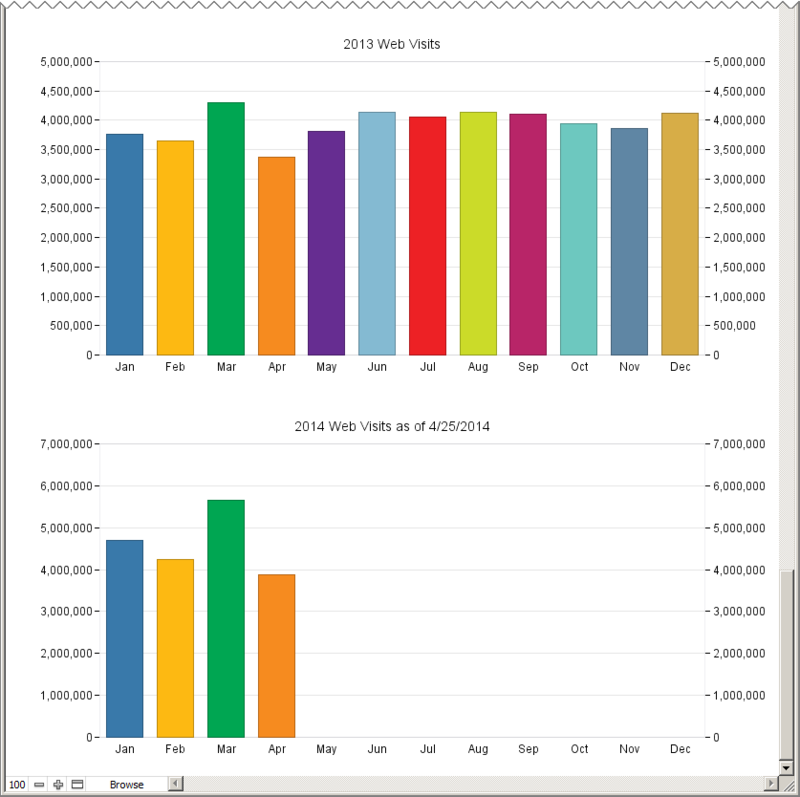 The web site went live in March 2006, so we don’t have any data for January and February of that year, but for the sake of consistency we want all 12 months to appear on every chart, whether we have data for a particular month or not (thereby ensuring uniform column widths and standardized monthly column colors) . Stated more generally: when producing multiple charts for comparison purposes, we want to make sure the labels on the x axis are the same for every chart, and if there are any “gaps” in the data, we want to make sure they appear in the correct location. Here are the variables we’ll be concerned with in this example. Why did I decide to use global ($$) variables, as opposed to local ($) variables? While it’s true that you can use $variables in charts, I’ve found that the pros of using $$variables (persistence, ease of debuggability) outweigh the cons (needing to clear them out between chart runs), especially since I can quickly and easily zap them with the help of a custom function, ClearRepeatingVariable. …and based on the user’s response, a $sortDir variable is set to either “ASC” or “DESC”, and will be utilized at the end of the script. Next, we take care of some preliminary details, including initializing the $serial variable with 1, and locating a set of records to report on. The next section is where the magic happens — we have two loops: an outer one to walk the years, and an inner one to walk the months, and as we iterate through the outer loop, we push each year into a new repetition for $$breakField (as per the green highlight). Note also that the $serial variable is incremented with each iteration of the outer loop. So if we produce nine charts, $serial will equal 9 when we exit the outer loop. …with help from the two custom functions highlighted in yellow here. In a nutshell, for each outer loop iteration (i.e., for each chart) SetRepeatingVariable loads up $cell through $cell with zeros, then the inner loop sets each $cell[rep] to a proper value where [rep] corresponds to a given month number. This way, we can grab monthly totals for months we have, and there will be a zero placeholder for any month we don’t have. Then JoinRepeatingVariable (a custom function by Sam Barnum, which was previously discussed here in July 2011) assembles those 12 individual $cell[reps] into a single return delimited list to be inserted into the appropriate $$yData[rep]. Finally, the script assembles a found set of records in the virtual table, displays the charts and sorts on the break field as per the $sortDir variable that was assigned at the outset. Well, we’ve covered a fair amount of virtual list charting territory, and introduced a number of concepts here in Example #1 which will apply to all the remaining examples… and we will explore those examples in part 2. Demo file has been updated to require FM 13 since it uses a 13-specific feature (calculated button labels)… thank you Tony White for alerting me to the problem. Can this technique be adapted to chart users selected years? For example, if the user specified that they only wanted the data for 2009 and 2013. Absolutely… constrain the found set to just the years you want to report on. The routine reports on the actual years present in the found set (see the image with the green highlight on $$breakField[$serial]). Much appreciated! I’ve been looking for a solution similar to this for quite a while now. One other question: Is it possible to chart the data for multiple years in a single chart? Yes, it’s quite possible. What you’re asking for (and what we did not see here in part 1) are multiple data series for the Y axis. Part 2 has some examples of this.